So, you've spent years building up your digital music collection, but now it's time to upgrade to a new music player - on a different hardware platform. You copy all of your tunes to the player, click on a song, and...get a dialog box telling you that, because of DRM, you can't play the song that you legitimately purchased on the player of your choice. What to do? Return the player? Or you could just pick up a copy of Aimersoft Music Converter and play your legally-purchased music anywhere you want! 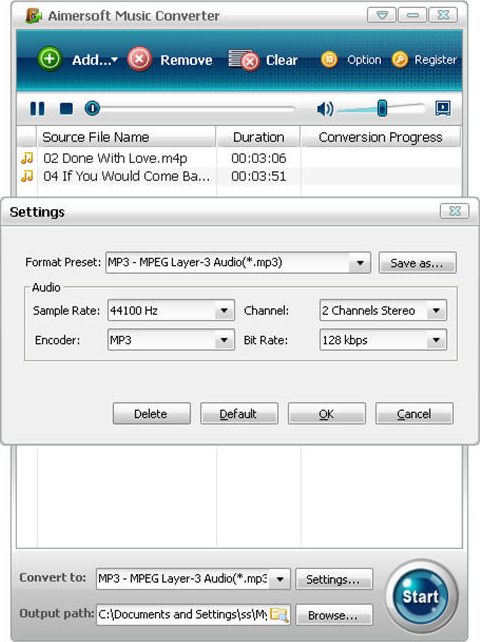 Aimersoft Music Converter removes the DRM from your digital music files and converts AAC, M4P, and WMA formatted files to MP3 format, playable in any and all portable and desktop media players. Additionally, Aimersoft Music Converter offers full support for all common audio formats, such as WMA, M4A, M4B, AAC, AC3, WAV, MP3, WMV, M4V, ASF, and many more. If you are highly particular about how your digital music sounds, you'll be pleased to know that Aimersoft Music Converter lets you tweak a variety of technical settings for your conversion. Customize sample rates, bit rates, audio channels, and conversion profiles. 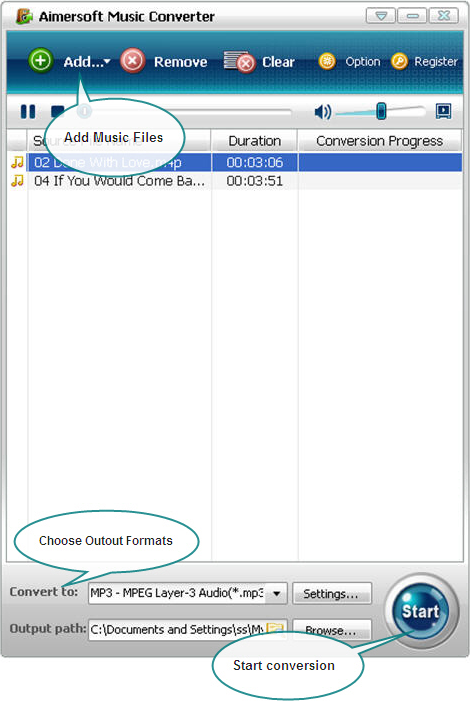 What's more, you can use Aimersoft Music Converter to convert multiple audio files to a new format in batch! Want to learn more? Make sure to take a look at the Aimersoft Music Converter homepage. Remove the DRM from your AAC, M4P, and WMA-formatted digital audio files! Play your music anywhere you want. Convert audio files between all of the popular audio formats. Convert multiple audio files in one session. Thanks for your interest in our product. The next Version that supports Vista 64 and Windows 7 will be released on Oct 2009. If you have any further question, please do not hesitate to contact us, thanks. gail f this is AWESOME!!! Tested a file and it worked great. buying now! Kosh Li does this include lifetime upgrade? Thanks for your concerns of our product. The Aimersoft Music Converter is once pay-off and all updates all free for our clients. Please feel free to contact us for any further questions. Thanks. Join and Split, Burn and Rip!